Level B is recommended for either 1st or 2nd grade classrooms. 1: What Can I Do With My Money? Students continue building their relationship with the Money Savvy Pig in the form of an attractive hand puppet which the teacher uses to talk through each of the eight 10 minute interactive lessons. The lessons are fully scripted to make each teacher a natural storyteller. 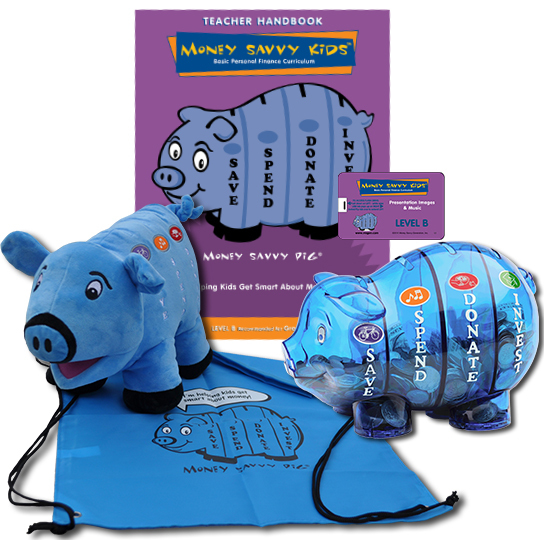 This friendly, fuzzy, blue pig, which replicates the format of the Money Savvy Pig piggy bank given to each child in Level C, is the perfect companion to teach financial literacy topics. Lessons, together with the infectious "Money Savvy Kids" song, help build solid auditory skills at this young age. A workbook with one or more worksheets to accompany each lesson reinforces new learnings and helps teachers assess how well the material has been learned. 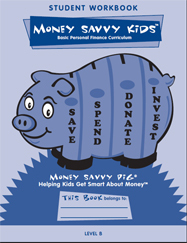 Parents get involved when their child brings the Money Savvy Pig puppet home for a "sleepover" and shares what he/she has learned in class.All instructional materials are included. Total teaching time required: 3 hours. Pre-requisite: Level A.